A series of reports over the weekend and today are lending credence to claims from earlier this year that media conglomerate News Corp is moving forward on a tablet-focused news service, amplifying those earlier reports to note that Apple is playing a crucial role in the development of the product, despite the fact that its distribution will reportedly not be limited to the iPad. One of the most specific reports in recent days came from fashion magazine Women's Wear Daily, which outlines News Corp's recent moves to hire 100 staffers to help bring the product, to be known as The Daily, to the iPad and other tablets in beta mode by Christmas at a price point of $0.99 per week. News Corp. has spent the last three months assembling a newsroom that will soon be about 100 staffers strong. 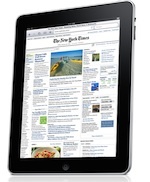 The Daily will launch in beta mode sometime around Christmas, and will be introduced to the public on the iPad and other tablet devices in early 2011. It is expected to cost 99 cents a week, or about $4.25 a month. It will come out - as the name suggests - seven days a week. The operation is currently working out of the 26th floor of the News Corp. Building on Sixth Avenue in a space that looks like a veritable construction zone. The staff's permanent home will be on the ninth floor, and they'll move down once it's ready. While the report only briefly mentioned discussions between Apple CEO Steve Jobs and News Corp CEO Rupert Murdoch about the project, The Guardian claims that Apple has played an integral role in the at least the technical side of The Daily's development. According to reports, there will be no "print edition" or "web edition"; the central innovation, developed with assistance from Apple engineers, will be to dispatch the publication automatically to an iPad or any of the growing number of similar devices. CNBC has also weighed in on the rumors, reporting that secrecy has been of the utmost importance during development of The Daily, with the floors directly above and below the offices of its staffers being "quarantined". The report notes that the publication will place a strong focus on interactivity and high-quality video. The tablet-only news outlet called "The Daily" will contain what is being described as "highly visualized" and interactive content. According to the report, high-quality video cameras will be used to provide content across a broad array of topics from news to gossip to children's content.